Personal Injury Attorney | New York & New Jersey | Law Offices of Adam M. Thompson, P.C. Personal injury cases are cases where someone is injured because of the negligent conduct of another party, resulting in injury or damage to the victim. The majority of cases we read about fall within the area of personal injury actions, including, but not limited to: auto accidents, slip, trip and fall accidents, construction accidents, premise liability cases, airline accidents and medical malpractice cases. 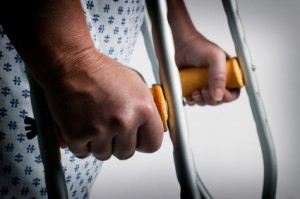 What should I do if I'm involved in a personal injury accident? Click here for more information. In order to recover damages for personal injuries received as a result of a personal injury situation, the injured party, called the plaintiff, must demonstrate that the person who allegedly caused the accident, called the defendant, was liable by failing to act in a reasonable and proper manner. The plaintiff needs to prove that the defendant was negligent and liable for causing the accident by failing to do something he was supposed to do under the law, or by doing something in a negligent or improper and unreasonable way. Once the plaintiff shows the defendant acted improperly and is liable for causing the accident, the plaintiff must prove and substantiate the damages he suffered as a result of the accident. Failing to prove either of the above, liability or damages, will normally result in your case being dismissed. Therefore, it is important to obtain all evidence relating to how the accident happened and what medical injuries and other losses were suffered. If the injured person was where he or she was not supposed to be, or was somewhere he or she should have expected the kind of activity which caused the accident, the person who caused the accident might not be liable because that person had no "duty" to be careful toward the injured person. If the injured person was also careless, his or her compensation may be reduced by the extent such carelessness was also responsible for the accident. This is known as "comparative negligence." If a negligent person causes an accident while working for someone else, the employer may also be legally responsible for the accident. If an accident is caused on property that is dangerous because it is poorly built or maintained, the owner of the property is liable for being careless in maintaining the property, regardless of whether he or she actually created the dangerous condition. If an accident is caused by a defective product, the manufacturer and seller of the product are both liable even if the injured person doesn't know which one was careless in creating or allowing the defect, or exactly how the defect happened. When there is more than one person responsible for an accident for example, if several careless drivers cause an accident the law in most states provides that any one of the careless parties is responsible for compensating you fully for your injuries. The responsible parties must then decide between themselves whether one should reimburse the others. This rule about collecting from any responsible person provides you with a couple of important advantages. If one liable person is insured and the other is not, you can make your claim against the insured person for the full amount. And even if both are insured, you will have to settle your claim with only one party. Initially, consider everyone your think might be responsible and have your attorney notify each of them that you may file a claim for damages. Then, depending on what you discover about how the accident happened, or which insurance company takes responsibility, your attorney might pursue a claim against only one. Even if you were careless and partly caused your injuries, in most states you can still get at least some compensation from anyone else who was also careless and partly responsible for the injuries. The amount of the other person's liability for the accident is determined by comparing his or her carelessness with your own. The percentage of liability determines the percentage of the resulting damages he or she must pay. This rule is referred to as comparative negligence. There is no formula for arriving at a precise number for a person's comparative carelessness. During claim negotiations, the attorneys for each party will discuss all the factors that might have resulted in the injuries. Then the question of your own carelessness goes into the negotiating hopper along with all the other factors that determine how much your claim is worth, such as the seriousness of your injury and the amount of your medical bills. Whatever that rough percentage of your fault might be (10%, 50%, 75%, etc.) is the amount by which the damages total will be reduced to arrive at a final settlement or award figure. Adam Thompson is an experienced New York City personal injury attorney who has successfully handled all types of personal injury cases throughout New York State and New Jersey. Let his past track record work for you. Call 855-497-2326 now or fill out our website's online contact form to claim your free, confidential case review.